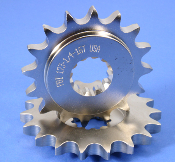 Note: These offset sprockets are universal in design but will have the same spline fitment as the models listed below. The width of the spline area may not match the stock spline width so a spacer may be needed. These sprockets are intended for experienced bike builders. 173- 530 chain offset sprocket options - KZ-1000 81-88 KZ-1000P 81-01, KZ-1100 GPZ 81-82.ZX-900 Ninja 84-86, ZR-1100 92-94, ZX-1100D ZX11 93-01, ZX-1100E-GPZ 1996, ZX-12R 00-05, ZZR-1200 Ninja 02-05, ZX-14 06-10. 530 Chain. Note: the stock part numbers that these offset may work with or have the same shaft fitment will be listed as options at the top of the part page of the part you are searching for per your year and model. These Offset parts may not have the spline width as the stock part and may require a spacer if needed. 1/4" 0.250in. or 6.35mm offset, 3/8" 0.375 or 9.53mm, and 5/8" 0.625 or 15.88mm.